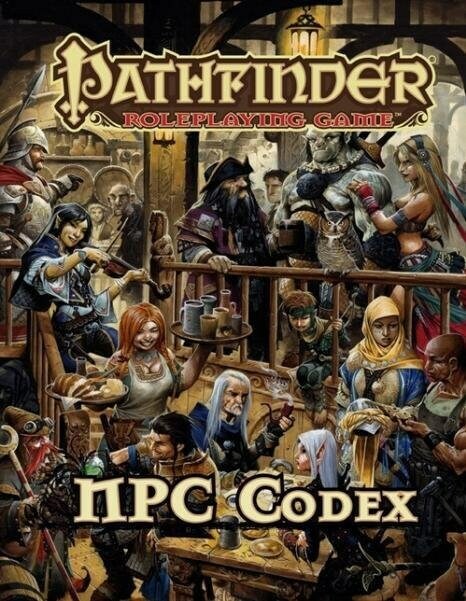 Populate your Pathfinder world with the NPC Codex, the latest hardcover rules reference for the smash-hit Pathfinder Roleplaying Game! This must-have compendium contains more than 250 fully-detailed Non-Player Characters ready for instant insertion into your campaign! With full statistics and tactics for characters of every level of every class in the Core Rulebook, the NPC Codex speeds prep time and adds new dimensions to your campaign! The famous "iconic characters" of the Pathfinder Roleplaying Game also come alive with statistics at various levels of development, providing ready-to-use player characters for any occasion. Gorgeous illustrations by Paizo's finest artists appear on nearly every page, adding inspiring visuals to game statistics you will use again and again!